Take the right steps to ensure that any inspection you may face goes as quickly and painlessly as possible. A visit from an OSHA Certified Safety & Health Officer (CHSO) can be an incredibly stressful experience, one that most employers hope they never have to encounter. However, inspections can occur at virtually any time, at any establishment, no matter what your industry. 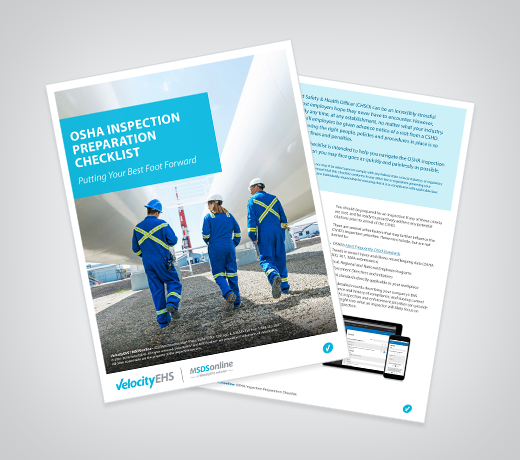 This OSHA Inspection Preparation Checklist is intended to help you navigate the OSHA inspection process, and help you identify the people, processes, and policies necessary to minimize your compliance risk should an OSHA inspector come knocking. Copyright © 2001-2019, VelocityEHS. All rights reserved. All other trademarks are the property of the respective owners.